Ogni settimana i Musei Civici di Bologna propongono un ricco calendario di appuntamenti, per svelare le loro collezioni e raccontare aspetti ed episodi inediti e curiosi della storia della città, anche attraverso punti di vista differenti e insoliti accostamenti fra le diverse collezioni. Conferenze, laboratori, concerti, visite guidate, visite in lingua sono i principali “strumenti” di questo racconto, che si dispiega lungo millenni di storia, dai primi utensili in pietra di uomini vissuti 800.000 anni fa ai prodotti dell’attuale distretto industriale, dalla pittura alle varie forme dell’arte moderna e contemporanea, dalla musica alle grandi epopee politiche e civili. Si ricorda che i musei sono aperti anche martedì 25 April, in occasione della Festa della Liberazione, con orario festivo. Apertura straordinaria per il Museo per la Memoria di Ustica lunedì 24 April, from 10 all 18. 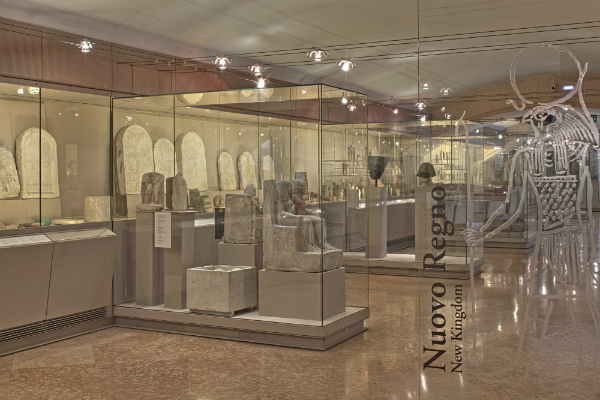 “Tombe, mummie e pratiche funerarie nell&#8217;antico Egitto” – Visita guidata con Laura Bentini, archeologist of the museum. Per gli antichi egiziani la morte non rappresentava la fine della vita ma il passaggio ad una forma di esistenza superiore ed eterna. The visit to the Egyptian collection of the museum will offer an opportunity to discover what were the funerary practices,,it,special rites,,it,the devices and objects that magically allowed the continuation of life in the Hereafter,,it,Music for children's rooms,,it,to play with your voice with its Collective QB,,it,The musicians of the QB Collective propose to children and parents to kick-start voice and gestures,,it,playing with musical ideas published in,,it,and in the most recent,,it,Papparappa,,en, gli speciali riti, gli accorgimenti e gli oggetti che consentivano magicamente la continuazione della vita nell’Aldilà. Meeting and workshop for children 2 a 4 anni, per giocare con la voce con il Collettivo QB. I musicisti del Collettivo QB propongono a bambini e genitori di mettere in moto voce e gesti, giocando con le idee musicali pubblicate in “Musica da cameretta” e nel più recente “Papparappa”, and creating fun and engaging group executions,,it,The Collective QB is an active group in Bologna at the Association QB Quanto Basta,,it,five professionals with different skills working in music with the kids,,it,conducting workshops and singing voice game,,it,narrations,,it,music therapy meetings,,it,& Nbsp; For the exhibition Strolling for museums,,it,Guided tour of the Medieval Museum and La QUADRERIA,,it,Medieval Museum entrance ticket,,it,Reports from the Archaeological Museum in wartime,,it. “La Scienza curiosa” – Workshop for children from 6 a 10 anni. Prenotazione obbligatoria allo 051 6356611 (within hours 13 on Friday 21 April). Guided tour with Ilaria Negretti, RTI Untitled s.r.l.. e ASTER s.r.l. “Cronache dal Museo Civico Archeologico in tempo di guerra” – Anna Tulliach Conference,,it,historian,,it,Alessandro Algardi and Bolognese sculpture of the seventeenth century,,it,Guided tour of the exhibition "Algardi,,it,three portraits in comparison "with Paolo Cova,,it,Starting from the beautiful wax models on display,,it,the visit aims to take stock of the history and the artistic career of one of the greatest Italian sculptors from Bologna of the seventeenth century,,it,Alessandro Algardi,,en,The 'golds room,,it,and baroque frames of the Davia Bargellini Museum,,it, storica dell&#8217;arte. Visita guidata alla mostra “Algardi, Bernini, Velázquez: tre ritratti a confronto” con Paolo Cova, RTI Untitled s.r.l.. e ASTER s.r.l. Visita guidata a cura di Paolo Cova, RTI Untitled s.r.l.. e ASTER s.r.l. In the history of the Bolognese Renaissance and Baroque,,it,the evolution and development of frames along roads possible with results of extraordinary merit,,it,The visitor will be led to the discovery of this artistic practice,,it,which reached its heyday in the Baroque period and was rightly celebrated by the Davia Bargellini Museum collection,,it,only one of its kind in the world,,it,Tullo Golfarelli,,sv,sculptor workers,,it,herald elegance,,it, l&#8217;evoluzione e lo sviluppo delle cornici percorre strade impensabili con risultati di straordinario pregio. The studies promoted by the publication of the monograph on this artist have restored the image of a man strongly linked to political and social passions of the time,,it,able to represent the struggles of the workers with Social Realism but also to express the grace and elegance of the Liberty style,,it,Vapor,,it,the new,,it,The activity,,it,designed for adults and children,,it,It is dedicated to the steam engine,,it,the most important technological innovation of the eighteenth century,,it,invented by James Watt from,,it, in grado di rappresentare le fatiche degli operai con il Realismo sociale ma anche di esprimere grazia ed eleganza di gusto Liberty. “Vapore: la &#8216;nuova’ energia!” – Laboratory-guided tour for families. Visitors can take a journey through the centuries to discover the history and use of heat engines,,it,Along the halls of the museum will be able to operate a model of Aeolus cell Heron,,co,scientist lived in the first century A.D.,,it,know some thermal machines as the seventeenth pressure cooker Dénis Papin and understand the workings,,it,with models,,it,the machines designed by Thomas Savery and Thomas Newcomen in eighteenth-century England,,it,As travel equipment,,it. Lungo le sale del museo sarà possibile mettere in funzione un modello della eolipila di Erone (scienziato vissuto nel I secolo d.C.), conoscere alcune macchine termiche come la seicentesca pentola a pressione di Dénis Papin e capire il funzionamento, con dei modelli, delle macchine progettate da Thomas Savery e Thomas Newcomen nella Inghilterra del XVIII secolo. Come attrezzature di viaggio, adults and children,,it,as travelers of the past,,it,They will have luggage and maps for orientation and to perform small experiments so as to better understand the power and versatility of the thermal energy and ingenuity of the steam engine which will make it the undisputed star of the Industrial Revolution,,it,Traveling to the afterlife,,it,images from the Etruscan stele,,it,Guided tour with Laura Minarini,,co,badge,,ro,Guided tour of the exhibition with the curators Luisa Gnecchi Ruscone and Jurate F,,it, come i viaggiatori del passato, avranno a disposizione bagagli e mappe per orientarsi e per effettuare piccoli esperimenti così da meglio comprendere la potenza e la versatilità dell&#8217;energia termica e la genialità della macchina a vapore che la renderà indiscussa protagonista della Rivoluzione industriale. Visita guidata con Laura Minarini, archeologist of the museum. “STIGMĂTA – La tradizione del tatuaggio in Italia” – Visita guidata alla mostra con le curatrici Luisa Gnecchi Ruscone e Jurate F. Licata. There is a thread that binds the Medieval Museum with Ötzi – also known as Mummia del Similaun, a Nicholas Lilin – author of the novel "Siberian Education", Danilo Rossi of Cossano Lajolo – researcher and scholar of Italian traditions of the knife and the stick, until you get to the Museum of Criminal Anthropology "Cesare Lombroso" Turin University: are all protagonists of the first exhibition dedicated to the history of Italian Tattoo held at the museum. Three themes are traditional tattoo in Italy: the tattoo craftsmen, religious tattoo of Christians and pilgrims, tattooing of criminals. The exhibition addresses these issues from the origins, digging up a past that has ancient roots. He told through the mummy and its 61 tattoos: are in fact the symbols of Mummia del Similaun to open the path with a photo exhibition dedicated to him. The materials are made available by the Anthropological Museum of Alto Adige in Bolzano. The Museum of Criminal Anthropology "Cesare Lombroso" Turin University has provided images and unpublished drawings by prisoners and affiliates to organized crime investigated in between 800 and 900. And yet the visitor can get in touch with the tattoo culture through photos, tools and prints from the private collections of Danilo Rossi of Cossano Lajolo, Fercioni Tattoo Museum and Art Tattoo Studio Marco Pisa. The exhibition is organized by the stigmata, and is held in collaboration with the Civic Museum of Ancient Art and the Tattoo Expo Bologna. The work of Isabelle Arsenault, that moves between cartoon and illustration, It features peculiar use of color that tells and is the mouthpiece of his characters' emotions, mostly teenagers, He is dealing with family relationships and the world around them. On display are exposed the original drawings of the first artist graphic novel, “Jane, the fox and I”, along with those of his latest work “Among Louis Spectra” (output for Mondadori), both made with the Canadian writer Fanny Britt. A special space is also given to the two biographies of artists illustrated by the author: “Cloth Lullaby, The woven life of Louise Bourgeois” (con Amy Novesky, published by Abrams and winner of braw 2017 Best art book) childhood of the famous French artist Louise Bourgeois, e “Virginia Wolf” (Kyo Maclear with, published by Rizzoli), which tells the intense and intricate relationship between Virginia Woolf and her sister Vanessa Bell girls. “Alpha” (The edito da Watermelon), a rich visual primer that reinterprets the NATO alphabet code with ingenuity and imagination, It is exposed through the halls of the museum, making a visual outline the musical codes and tools that the museum holds. The exhibition is curated by Hamelin Cultural Association in collaboration with The Pastèque, Mondadori, Transbook Children’s Literature on the Move. What happens when great musicians, graphics or artists, in short, authors often consociuti in a completely different field, They decide to compete with the world of children's books? An exhibition to discover the amazing picture books by authors “unsuspected”, as the musician John Cage, the artist Paul Cox and the graph Milton Glaser. In also shows other small “pitch invasions” from Ó.P.L.A, the archive of the artist's book for kids Merano, with picture books created by John Lennon, Dino Buzzati and Emilio Isgrò. Opening time: from 3 April 8th 2017: ore 10-19; from 9 al 22 April: martedì, Wednesday and Sunday hours 10-18; giovedì, venerdì e sabato: ore 10-19; lunedì chiuso; domenica 16 it's Monday 17 April closed. In displays the tables realized by Sophia Martineck for its interpretation of the comic great classic Brothers Grimm. A timeless tale filtered through a contemporary look. The German illustrator and cartoonist reads the story with lyricism and lightness, through a suspended, the dynamism of dialogue and action that characterizes the language of comics. Alongside original drawings will be exhibited color reproductions and material sources of inspiration, on a path that plunges into the original flavor of the fable and in the creative process of the designer. The comic book Hansel and Gretel is part of the new series dedicated to childhood "Dino Buzzati" Dog Days of editions and is part of the larger project "Dog Days Children" in which the balloon is at the center of educational sessions that promote reading and practice art by seeking dialogue with other forms of storytelling. La mostra, held at the Library Mambo, on the occasion of BOOM! Growing up in books and Bologna Children's Book Fair, Heat wave is curated by cultural association in collaboration with Education Department MAMbo, Goethe-Institut Rom and Fondazione Monte di Bologna and Ravenna. Opening time: from 2 al 6 April 2017: ore 10-13 e 14-19; from 7 April to 5 maggio: Tuesday and Thursday hours 9-13 e 14-18; Wednesday and Friday hours 9-14. Closed Saturday, domenica, Monday and Tuesday 25 April.